Published by Michael O'Mara Books Ltd.
if you got the right change at the checkout? how much paint you need for your kitchen? 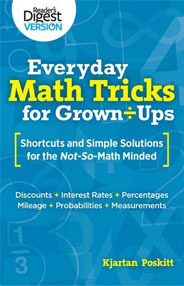 about the new ways your kids are being taught to do sums? how to spot the best special offers in shops? what on earth is π all about? how to make a rough guess at an answer? how to convert kilometres to miles? what's the difference between line, area and volume? how to change normal fractions into decimals? how to work out the interest on money that you're borrowing or saving? You can click the cover to order your copy from Amazon. Why does this work with any number? It's all explained with algebra. Use negative numbers to check if Mrs B approves or not! You can multiply any two numbers just using the 2 times table. Step by step instructions for everything. I first got the idea for this book when a mate asked for help getting on to a management course. Blakey is about 40, worked all his life and as intelligent as anyone I know, but as he told me: "I can just about add up and take away, but when it gets to multiplying I lose it. Even with a calculator I don't know if I've done it right." So I lent him a copy of my book The Awesome Arithmetricks which I'd written for eight-year-olds. A few weeks later, Blakey had passed the maths test and been accepted! I realised there are an awful lot of people like Blakey who, somewhere along the way, missed the boat when it comes to working with numbers. What's more, it isn't easy getting help unless you're able to find the time to join adult numeracy classes. Therefore this book takes you through everything. It starts with the very basics of "how to add" and explains how the 1,2,3 number system does a lot of the work for us. Gradually it works up through subtracting, multiplying and division... then it takes off into lots of different fields giving you enough information to know what you're talking about. Of course if the early part of the book is too easy for you, you can just skip it. But if you get stuck, you can go back and see where you lost the plot! All the basics are established including the new methods taught at schools. You'll learn a short cut to checking a till receipt quickly and even master the dreaded LONG DIVISION! Everything you need to know including how to convert between them and how to spot the best bargains in shops. How to work out tax, service charges and interest rates. All about squares and cubes, and how massive numbers can be written easily in Standard Form. Means, modes and medians all explained. Everything you need to know about equations and formulas - and then you'll see how a few strange number tricks work! Metres and litres, mega and milli, everything is listed and explained including how to convert lengths, weights and currency. 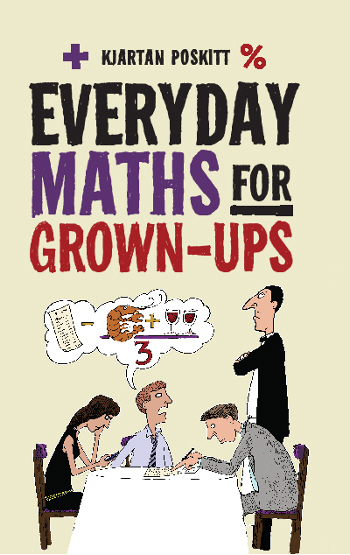 Everything from home improvement calculations to Pythagoras and his Theorem! Learn a few sneaky tricks as you discover the maths behind dealing cards, throwing dice and placing bets. Now you've got this far, what on earth were trigonometry and logarithms all about? A quick A-Z of all the odd words and terms that crop up from ellipses to quotients. In addition to the above, there are sections on ratios, estimating and rounding off, plus several tricks and features on things like curved space, the size of atoms and the chances of poker hands. 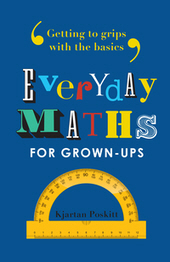 Kjartan Poskitt is probably best known as the author of the Murderous Maths series of children's books. He has also written a GCSE maths help book, maths activity books for the BBC, he has contributed articles to magazines and he regularily tours theatres, schools and festivals performing maths tricks and trivia. His other writing includes plays and musicals, books on space, codes, mazes and puzzles and several children's novels. Older people might remember him presenting many BBC TV Schools science and maths programmes, and even appearing as a regular on Saturday morning Swap Shop. He lives in York with his wife and family, several old music synthesisers and a pinball table.